We just pushed out an update which polishes the title only view and the cards view. People use the title-only view to crunch through lots of content as efficiently as possible. So we pulled out the engagement count into its own column to let you quickly identify the most engaging content published in your feedly. The cards view, on the other hand, is useful when you want to glance through visual content and are looking for inspiration. So we simplified it so that visuals play a bigger role. These are 2 of the 4 views you can assign to different sections of your feedly by clicking on the gear icon at the top right of each page and selecting the presentation option. Do you take advantage of the different views? What is your favorite view and why? I really like the counts in the Title Only view. Well done! Reblogged this on Daily Tech and Health Dose News. Please give us the ability to remove the count column in the title view. I don’t care what other people are reading! Also, several of my feeds have similar titles, and with the reduced title length it is much more difficult to tell which feed I am reading. Please bring back the longer feed title, and don’t show me the count. Yes, I totally agree with this! Good feedback. Will talk to the dev team about this. It should not be too hard to offer a knob which allows users to turn off the engagement counts. Thanks, that would be fantastic. I’m amazed at how responsive the Feedly team is to all of our feedback. And thanks for communicating so frequently with your users! If possible, it would be nice to set such a knob per category and per feed. I have some categories and some feeds that are not all that crucial to me but spits out a lot of updates. I usually just skim these and I find the counts can help me spot the more relevant updates from a stream of updates for these feeds. Then on the other hand I have feeds where I would instead want more title length to help me determine what I want to read and what not to read because the general opinions of others do not help much in determining what is interesting for me. So in general I like the counts separated quite a bit, but would definitely appreciate a per category/feed (hierarchical) setting to be able to turn it on/off. I don’t really care about engagement counts, but I’d certainly like a way to remove the new “Most Recommended” section atop the page. It’s a waste of screen space for folks that don’t want it, and I’d prefer if it were an option rather than enabled by default. Showcase the 3 most recommended posts at the top of each page. I could see those also benefiting from being a setting on category/feed instead of just globally though. Thank you again, David, for the useful aicdve and info. My 2 cents: I signed up with Google Reader then just never used it so I guess I’m one of the lucky ones (this time). My RSS feeds are collected in My Yahoo which, like everything else, will not suit everyone but works for me. Goodbye to Google Reader then.As an aside, I recently switched from using Google for all of my web searches to duckduckgo and I’m pleasantly surprised by its performance and pleased that it has some respect for our privacy. Google (the company) do great things but could be accused of privacy abuses. They also, allegedly, go out of their way to pay no, or less, tax than they should (at least in the UK). While this could be argued as good business sense, it feels like it’s the polar opposite of the image they like to project as an organisation. I agree with most of your points, but a few need to be disecssud further, I will hold a small talk with my partners and maybe I will look for you some suggestion soon. I completely agree as well. Would prefer more room for the titles over the engagement number. Honestly, I spend a lot of time every day looking at the list view and I never once have paid any attention to that number. Nice to see it when opening an article as a matter of interest, but yes, mostly it’s just in the way now. Like the frequency of improvements to Feedly, just not necessarily each and every improvement itself. Also totally agree. I can see it hasn’t been changed yet. I have exclusively used title-only view. When I’m devoted to much reading, it’s the most efficient way to page through and click one article after another. When I’m scanning for something worth reading, I’ve thought it easy to speed-read the titles and names of the sites in this view. Now that you say “looking for inspiration,” though, as a reason to try another view, such as cards, maybe I should give that a try. I happen to have an enormous number of unread articles at this moment. Maybe something other than just words can draw me in to whatever might nonetheless have good words to read at this point. I use the magazine view to scan through my feeds and save the ones to later read in full. The titles-only view does not provide enough information for this. Can I remove the engagement count column from the title-only view? It’s just unnecessary clutter for me that adds no value. It wouldn’t matter if an item says 1,000,000,000 people read an article or 0; I don’t want to be told what other people read and it is annoying to have anyone presume they know better that I what I should read or waste a column on that. Would a simpler indicator (1 bar, 2 bars or 3 bars) be better or you do not care at all about that information? Oh that’s interesting. Personally I don’t care at all about the information, but if I did I feel like I’d want to know the more detailed data (i.e. the exact number). I enjoy using the Magazine view, as it is closest to the default Google Reader semi expanded view (e.g. on focus the article expands, but otherwise shows a picture (if applicable) and a useful blurb). I love the engagement count column – it adds so much value to my feed. I would even love to be able to sort by the engagement column count. +1 I also find the engagement count useful and would also like to be able to sort by engagement count (but not via a Preference settings: it should be dynamic, for example by clicking on an Engagement count column header). A side effect of the change you made to the title only view is that when you’re in a folder looking at posts from multiple feeds, the titles of the individual feeds have quite a bit less room to be displayed in their column, and get cut off rather abruptly now. The added ugliness to my feed list isn’t worth the room given to a feature that I don’t use – I have no need to know how “engaging” an article is to other feedly users. At best it’s distracting, and having an option to turn off the engagement column and let my feed titles within a folder breath a little would be nice. What do you guys think? I just realized this had been addressed in the comments already. My bad! Thanks for listening to the idea up there. I just finished a heavy book too and dedceid to take a break to visit some other readers. My next book needs to be a light read although I’m not yet sure what it will be. Yeah, the title-only view is super important… lots of feeds have tons of stuff, and if each article was a picture etc, they’d be completely unmanageable. Pictures are evocative, but they tend to be distracting when there are lot of them, and make it harder to scan. One piece of info that would be _much_ more interesting, I think, would be a count of how many user comments there are on the target page; for many topics, the user comments on a article are more interesting than the article itself. I guess there’s no easy way for reedly to get that info since there’s no common commenting system, but… it’d be cool if it could. I was very disappointed this morning when i opened the cards view (my default). This was my favorite view but now it’s almost totally useless for me. After going through 2 pages (I have 200-300 items arriving each day, mostly work related) I found that I had to open too many items before I could make the decision to read, keep or trash them. The small preview used to save me a lot of time. You can also add me to the list of people who pay no attention to the “engagement” count and see it as wasted space. Maybe you could make it an optional feature. Ditto! I originally switched to Feedly because I loved the look of the Cards view — it was so much more elegant than anything else I’d used. But I need that short preview to know how I’m going to prioritize my reading. I realize I get this with Magazine, but that look isn’t the same enjoyable experience I’ve had with Cards. Feedly, I appreciate your desire to keep improving, but the more you change, the more it seems you’re overdesigning. I had no idea how much I relied on that little blurb under the picture and title for information. Same deal, loaded it up today and now I have no idea what to read or what not to read. I am very disappointed that the age of the articles is also gone from the cards view. Sorting by age is fine, but without the specifics I find that too much time is lost opening items that are just too old. Agreed. I also liked the excerpt that was previously included. I feel like the latest update to the cards view was a step in the wrong direction. I pretty much exclusively use ‘Full Articles’ view and Unread only and oldest first filters and it drives me absolutely nutty that once I’ve read everything you show posts from a month ago. Sometimes the article shown is something I’d rather not see again, but I’m stuck with it until some new content comes along. I used to be able to hide it using css, but you removed that ability in a update a while ago. Can you please stop showing old posts once I’ve read everything? I reported this bug a few weeks ago, but still hasn’t been fixed. Bug: If you have “Auto-Mark As Read On Scroll” option on. 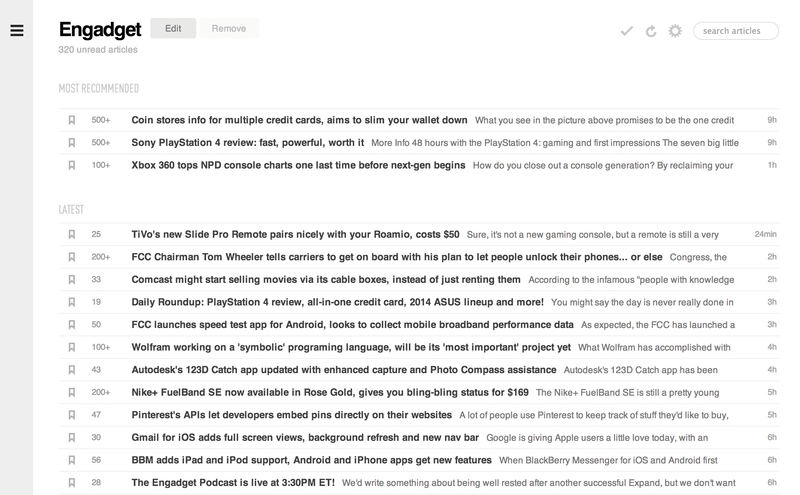 RSS feeds under “cards view” only mark the left row as read; 1 of 3. I also use almost exclusively the cards view and sometimes the full article view. The cards view lets me scroll down lots of useless posts in a more visual way so I can find what’s more interesting in seconds. There’s no way to mark all posts as read on scroll. This is something we’ve been waiting for since feedly first added the option. I also find usefull having a full range of possibilities for marking as read. For example “mark as read post older than x days” would help me mark as read those posts that mark as read on scroll won’t. Geez, that’s unllbievabee. Kudos and such. Dito on that! Cardview is nice on a lot of feeds but this bug makes it useless. > Do you take advantage of the different views? Yes: I use title view for news feeds and cards view for more visual content. Cards view before the change was much better for me though. I feel the same, the old cards view was way better for browsing. I really miss that you can see the first few words of an article … now I’ve got to open most of them to really know if I want to read it. Another happy user here. Importing my feeds was easy, and their revenue straem is selling an awesome RSS service to me, not selling my data. I appreciate that these days. (Also, open source from top to bottom, so I could host it myself if they went out of business. This is more interesting to geeks, less interesting to non-technical folk. )Bryan: might I suggest then, that this isn’t for you? Some of us find a standard for decentralized content syndication useful; you don’t, and that’s cool. Just, perhaps, consider that your use case isn’t a universal one. Yup ,really shame, I used the card view as it was the best mix between enough information to decide to click, but small enough to get loads on a page. Balance has been tipped in the wrong direction now. I also find the headline on a coloured block of text for items without a picture really jarring. This happened two days ago, so it’s probably not related to this update, but the Refresh button has disappeared from the Index screen. Please return it. If you want to implement some kind of automatic, Ajax-style refresh, that would be fine, but as it stands that doesn’t exist either. BTW, I wouldn’t actually need to use the Index screen much if you would only allow us to see the feed list *permanently* along the left side of the screen in browsers that aren’t maximized or at least greatly widened. Google Reader never had a problem with my chosen browser width. Yes, bring back the “refresh button on index page”!!! Also, people have been asking this for long, could you please move the “index” page link to the top part of the left menu?? Before “all” & feeds. And bug report: when clicking a bit to the left of “index” link, where an icon would be, you’re routed to “Organize” page. I also miss the refresh button. Browser reload breaks the experience of the web application. You should not have to rely on browser buttons. Thanks for the change in pulling out the counts of how many shares/starred for later of the articles in a separate column in front of it, it will be better instead of original after the tittle which varies the position due to the length of different titles. However, I would like to ask about the subscriber counts after the subscription of certain source, which originally under title of the RSS source. It seems it’s silently removed some times recently. I would consider having the option for the users to let them customize it if possible. Finally, I would like to draw your attention about the constantly crashes and hardware buttons partially functioning of v17.x android app on 4.1.x. It happened more than a month ago, and many users reporting the problems about it, including me. Till the moment, there is no response from your team about it, no matter through Google Play comments, Blog thread comments under v17 and also v17.1 released posts, email (care@feedly.com) from my experience and observation. I sincerely understand it will require time to take action to rectify it. However, till the moment all the users suffering from the problems are helpless with the problems, no response, not even anything about investigating, fixing or acknowledging. Please take action on this. Many users would like to provide as much information as they could to help you rectifying the problem, but what they received is not even a word about it. I use Magazine view all the time as it shows enough information for me to decide whether to read the article or skip over it. Title view doesn’t show enough information to do this. But I have selected feeds where I do read most of the articles. I can see that Title view would be useful if I had to scan quickly over more general feeds, looking for the occasional article relevant to me. WHAT DOES THE “ENGAGEMENT” COUNT REPRESENT??? I’ve been asking this before. The numbers are very suspicious since many feeds with only 1-5 subscribers (I checked this behavior back when Feedly still had “subscribers” count visible) have had items with many hundred “engagements”. Why don’t you come out and explain what “engagements” mean!?! When did the following change occur? Why didn’t you tell us about it? – The “home” page, in some views (I don’t if every view has this or not), there’s a “PROMOTED” category with some random RSS items from a RSS feed that IS NOT in your subscriptions!!! WTF!? Once again I see that you have made changes to cloud.feedly without telling us!! WHY? How is it so hard to publish a proper changelog??? Why are you so stubborn? Don’t you understand that it benefits both you and the end users! Another thing; the “home” page “mark as read” and “refresh” buttons ARE TOO CLOSE to each other. Accidental slight slip of the mouse cursor and items from MANY different feeds are marked as read. Not good! I have been asking about this for long; why doesn’t the “auto-redirect” go to my selected (in the options) “home page” after I have marked the last feed with unread items as marked? Instead you redirect to “All” page!? Why? If I’ve selected my “home page”, why don’t you redirect to it after all is read? I’m using the Index page as home. Update to the “PROMOTED” category subject: Now I see a “THANK YOU” category in every view in home page. I really don’t like the way Feedly is going with these “updates”. What next? Do we have to click some sponsored links before you show us our feeds? Basically to follow up on the uptade of this matter on your web-site and would really want to let you know how much I loved the time you took to write this beneficial post. Inside the post, you spoke of how to actually handle this challenge with all comfort. It would be my own pleasure to get some more strategies from your web site and come up to offer other people what I have benefited from you. I appreciate your usual wonderful effort. I use the “Full Articles” view but hate the loss of horizontal space due to the “You Might Also Like” box that’s a few lines long. Please give me the option to turn it off! I’m also neutral on the fixed-width of the view. Why not let it go the whole browser width (like the “Title Only” view) and let people control width with browser window size (or at least add another toggle). A question: Why are the engagement counters left aligned? With a dedicated column it makes more sense I think to have it right aligned (like number columns often are). That way you can easily see orders of magnitude. I still see the bug where, in Full Articles view, and advancing to the next story using the ‘J’ key, the feed gets confused when it reaches the last few items. Often it gets stuck between two feeds, and I can’t advance to the last item. Or, it requires two keypresses, where the first marks the next item as read, and the second advances to that item. I too vote for a removal of the count…I am sure others care but I don’t care about “engaging” article counts. That said this is a very minor issue for me meaning I don’t much care either way. There are other things I care much, much more about with respect to Feedly. Looks broken on IE11 (Win7). I actually really liked the old Cards View. My biggest gripes with the new look are the fact that it removed how old the posts are, which I found really helpful, and the fact that the cards themselves have a fixed size, which is much larger than original Cards view. 1. Extra options to customise the Cards View; much like the Title View has some additional options for tweaking its size. 2. Bring back the old Cards View as another alternative view. If bringing back the old Cards View is too much, then perhaps bring back some of the features (how old stories are, article preview text, resizing, etc) as toggleable options. Actually just noticed that all the stuff that I said was missing actually only happens on some of my feeds, specifically how old the article is. It seems ot be that the new formating of the cards leaves very little room for some of the info in the card itself, resulting in some of the text being clipped and unviewable. Again, I still think that additional formating options would be useful here, but just wanted to clear things up from my previous post. I’m truly enjoying the dgsein and layout of your website. It’s a very easy on the eyes which makes it much more pleasant for me to come here and visit more often. Did you hire out a developer to create your theme? Excellent work! Por favor, permitan usar Feedly sin cuenta de Google. Es molesto tener que iniciar sesión con Google. Please give me back the original cards view (or rather, the recently-modified cards view with larger pictures). I really need those little text preview below the photos and the time when the post was created. I totally agree. These two options were really useful for me. 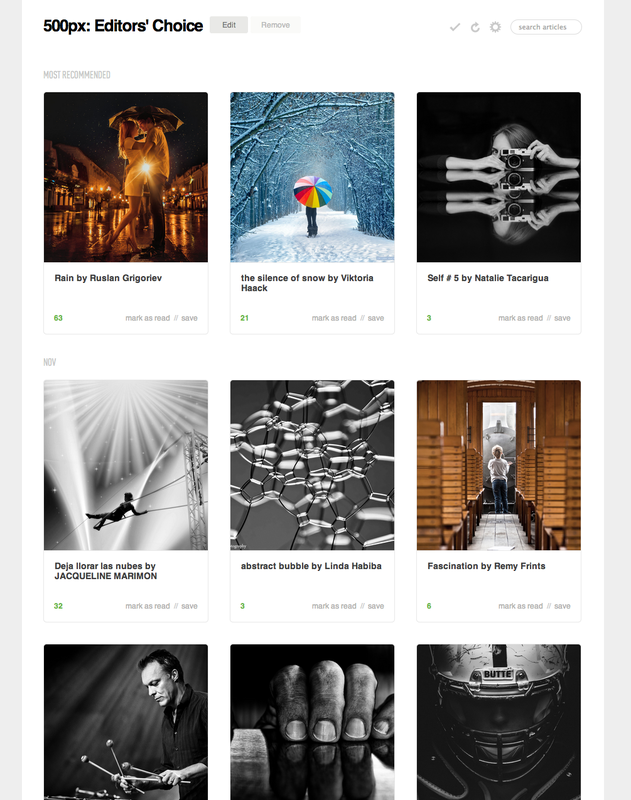 I use Feedly for photographic curating purpose, and I use both Magazine and Cards view. I use Cards to quickly parse categories of blogs I appreciate less, and Magazine for the ones which usually interest me more. 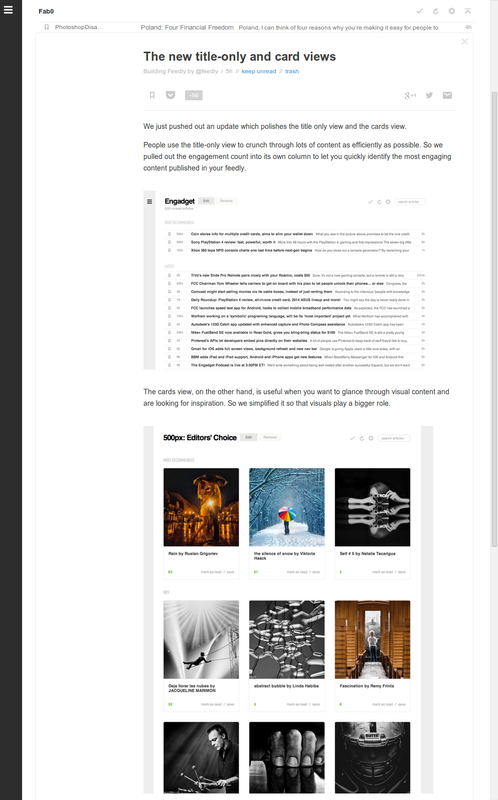 Also I’ve made an userstyle in order to use Feedly with uncropped images, see the link associated to this comment. Full article view, but *hate* the fact there are read articles displayed despite there being a (checked) option to hide read feeds. The new Cards view probably doesn’t cache anymore imageson your servers but fetch them directly from the sites: this means I don’t see most of them being behind a proxy. I use often the Full Article view but for some reason it too refuses to work if the rss feed contains only an image without a properly encoded page. Wow! After all I got a web site from where I be capable of really obtain valuable facts concerning my study and knowledge. I’m really enjoying the design andd layout of your blog. I believe that you ought to write more on this issue, it may not be a taboo matter but typically people don’t talk about such topics.